Only opting for the Android training is not enough as android developers have wide opportunities to pursue their career. Yes, there are various courses for which Android developers can opt for as per their interest including framework, maintenance, custom etc. The list is endless but to opt for the best android course as per your desire is essential. 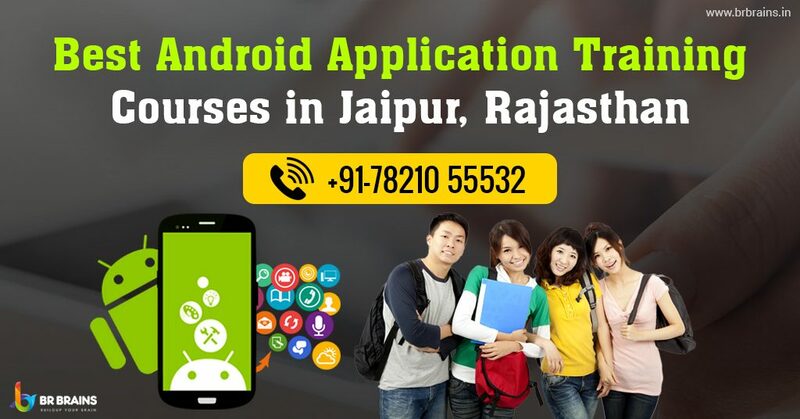 In this article, BR Brains the well known Android institute in Jaipur offers you a perfect guide for the android app course to enhance your career in a best way. Advanced and professional android courses with which you can pursue in the global market. 2) Android SDK Tools: In the Android SDK training program, Android developers are enabled to create the apps for the Android platform by using the SDK software tool. It requires the knowledge of source code, emulator and source code. 3) Android Layouts and Control: A perfect developer should know how the app can turn appealing and interesting and this is focused on the designing part of the Android sector. This course includes all the part of designing and layout. 4) Android Customisation Course: In the customization course, developers get prepare to offer the customize android app to the user. Hence, it includes minor and major changes in the particular as per user interest. 5) Android Testing and Maintenance Course: In this, the testing part can be considered as an overview functionality of the Android app. A final test is essential for the app, in which it includes the testing of overall application before launching in the market. Along with this, it includes the maintenance part of the app for smooth functionality. So, there are the different android courses that developers can opt for. But to grab the skills of the best mobile app development course, in an effective way is also essential. If you are looking for the best android training in Jaipur. So, BR Brains is the perfect choice to opt as the android institute to grab the skills. Why choose BR Brains as the Android training institute in Jaipur? 1) High Tech Lab: We have a high tech lab where developers can do their innovative experiment and in a peaceful environment with all the basic requirements including tools and software. 2) Live seminars: BR Brains offer live seminars to our students to bring them in the professional and live environment. By the live seminars, android freshers are able to know the real life challenge and android market condition. 3) Placement: Our team helps our students to get the best jobs in the android market by providing reference and guiding them for the android interview process. Even we help them, to get the best jobs and guide them to apply in the jobs. 4) Expertise Faculty: BR Brains have the best android professionals from all around the world, who have the best experience in the Android field as well as they have best education and skills. They have years of experience in the android teaching field. 5) Certificates: We provide the android certificates to our trainee as it will help them to apply in the companies and it will increase the chances of the job. The certificate can be helpful to show it in the colleges as you have completed industrial training in Jaipur. Android training is considered as the best mobile app development course to enhance your career. Once you have completed your training and grab the skills no one can stop you to hit the android market.